Resell SEO Services with your own website! Autopilot, no experience needed! I will create a complete website for you to resell SEO services from SEOClerks. 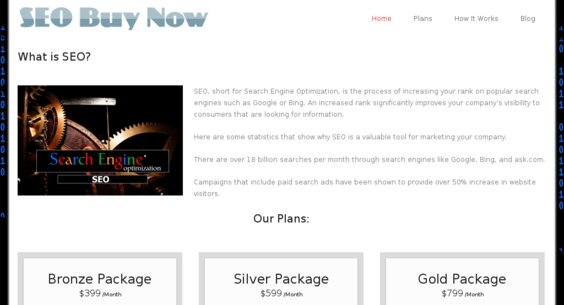 Example: Sell a service for $300 and buy the service from SEOClerks.com for $50. This website can generate instant profit! Fully Outsourced! No experience needed. Earn an easy $3k/month! This is a service website that makes income by supplying services to web site owners. This site will be built to be sophisticated and user friendly to impress your potential clients. All of the work is done by the supplier, which you can choose from SEOClerks. You only need to send the requests to the supplier and then deliver the completed order to your customers. Once the order is placed, the clients will provide their information, which you will then forward to the supplier. The supplier will notify you when the order has been fulfilled. That is the simple process of operating this website. Professional design that is easy to navigate on any device including iPhone or Android. Multiple income sources to ensure financial success. Easy Social Media Integration: Add a Facebook, Google+ or Twitter Page in a matter of seconds. SEO and keyword optimized for a better chance of search rankings. Powered by Wordpress: A user-friendly platform that allows for limitless amounts of customizations and a quick learning curve. Resell SEO Services with your own website! Autopilot, no experience needed! is ranked 5 out of 5. Based on 1 user reviews.